The patio at Gunther & Co.
More outdoor dining spaces have come on the scene making al fresco dining in Baltimore a highly anticipated summertime treat. 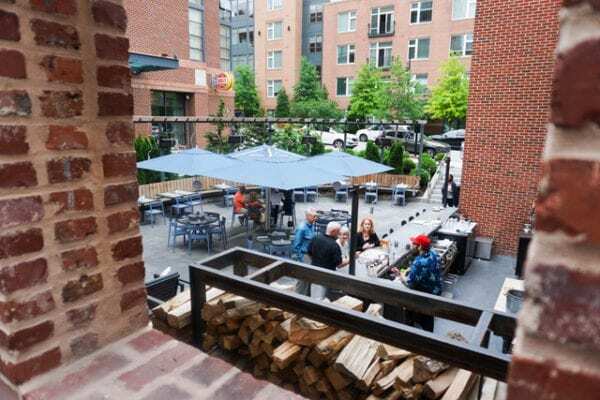 Parisians have sidewalk cafes to linger in summer, but Baltimore has hidden rooftops and patios for outdoor dining that you can find in many neighborhoods, from Brewers Hill to Hampden. In Brewers Hill, Gunther & Co.’s 50-seat patio dining space (one of the larger local outdoor dining patios) is the go-to destination. There are two living walls out there, a vertical natural landscape of pollinator plants and organic herbs. They aren’t just for show: the herbs are used in the kitchen and as part of the cocktail program. The living wall at Gunther & Co.
“We’ve worked hard to make our outdoor space a welcoming destination for the neighborhood, and we’re looking forward to celebrating the unofficial start to summer this Memorial Day Weekend,” says Nancy Hart Trice, Director of Operations. Her modern American restaurant, with global influences, puts a local spin on food and craft cocktails. Hart-Trice and Jerry Trice, the executive chef, (the two recently married) opened the restaurant in 2016 after years of experience in the Washington D.C. and New York food scene. Here’s a fun part of the summer program at Gunther: On the second Tuesday of every month the restaurant partners with Tito’s Vodka for a Yappier Hour. Bring your pup to the patio from 6 to 8 p.m., and Gunther & Co. will donate two bucks from every cocktail to BARCS. The patio fills with canines and their human companions. There’s something extra-refreshing about having a drink while relaxing outdoors. Happy hour drink specials at the Mt. Washington Tavern, available in the bars only (which includes the rooftop deck, the Skybar) are available Monday through Friday from 4 to 7 p.m., when select draft beer and wines are discounted. Come Monday and Wednesday for $5 Margaritas and Thursday night for half-price bottles of the entire wine list. Daily happy hour food specials come free with a drink. The Skybar at Mt. Washington Tavern. There are also half-price burgers and discounted wings on Monday nights and house oysters (tavern salt) for a dollar each Monday through Friday. The Skybar serves nightly dinner specials out on the deck, too. One of the best things about the Skybar is that it’s above the street. You don’t see cars or buses go by, just the charming facades of the cute stores and cafes across the street and rooftops of Mt. Washington. There’s even a hanging garden — in bloom soon! — to add to the atmosphere. The rooftop view at Mt. Washington Tavern’s Skybar. Cosima, situated inside the old boiler room in Woodberry’s historic Mill No. 1., gives guests a unique outdoor experience. Cosima’s tranquil patio sits along the Jones Falls offering incredible views of the waterway. You may even spot a Great Blue Heron during the day. At night the stringed lights transform the patio into a romantic spot. A bonus: You may discover Baltimore from a vantage point rarely seen. The mill gained national recognition for its thorough and thoughtful renovation. The soaring space is rustic yet modern with the original brick and stone walls of the old boiler room adding ambiance. Reclaimed wood from old Baltimore houses make up the tables. Executive chef Donna Crivello, who also owns Donna’s restaurants, named Cosima after her grandmother. Cosima hailed from Sicily, where the food is known for fresh and seasonal ingredients but is also a mix of all surrounding Mediterranean cuisines. Outdoor dining on Cosima’s patio. I scarcely knew what to make of the grilled whole Bronzino one of my dining companions recently ordered. She didn’t know where to begin to attack the huge (yet delicate) fish – head or tail. But it was sublime if a little intimidating and perfect for a summer evening. The bar program also is inspired by Italian flavors; all the wines are Southern Italian, and there are 24 Amari, the traditional Italian herbal liqueur. Try an Il Fumatore: Bonzl Mezcal, Zucca Rabarbaro, Contratto Sweet Vermouth, Grappa Mist, and lemon. And the sfinci, Sicilian cinnamon sugar donuts, are a must for dessert. Cosima recently added a mobile bar in the front courtyard for happy hour. They will move the bar to the back patio for Sunday brunch, and it will make appearances occasionally during dinner hours. The Eastern Shore inspired Gertrude’s is named after owner and “chief cook and bottle washer” John Shields’s granny (do we see a trend here?). The beautiful patio is on the edge of the BMA’s Wurtzburger Sculpture Garden. The outdoor patio at Gertrude’s sits on the edge of The Wurtzburger Sculpture Garden at the BMA, shown above. “It’s a little oasis that truly takes you to another place,” says the world-famous chef. The Wurtzburger Sculpture Garden is open the same hours as the restaurant (every day, check the website for hours) with seating for an additional 80 guests surrounding a fountain and reflecting pool. Beginning in June, Gertrude’s will host Wednesday patio parties, “like a happy hour with games and an array of cocktails to go with the various themes,” Shields says. He will also hold special Chesapeake Cooking events out there to go along with his new book, The New Chesapeake Kitchen, coming out in September. Artisan food makers, farmers, and watermen will co-host the events. It’s now summer and whether you seek a lively patio, a waterside terrace, or an elegant garden, options abound for outdoor dining and drinking in Baltimore. Get out and enjoy the good weather while you can.